CEED Counselling 2017- कॉमन एंट्रेंस एग्जामिनेशन फॉर डिज़ाइन काउंसलिंग is soon going to be conducted after the declaration of CEED score card 2017. CEED, generally abbreviated as Common Entrance Examination for Design, is a National Level Entrance Exam which is organized by Indian Institute of Technology, Bombay through which candidates can take admission in the courses of Master of Design which is offered by the IITs and IISc. 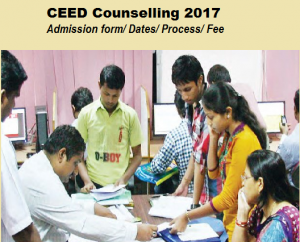 CEED Counselling 2017 is going to be conducted for all the applicants who successfully qualifies CEED 2017. The CEED Counselling Schedule is not going to be conducted commonly for all the institutes, thus applicants must apply separately to the institutes from where they are interested in pursuing M.Des degree. All the eligible candidates must further check the admission notification and apply for the IITs as per their choice through CEED Counselling 2017 application Form. The eligibility criteria varies from institute to institute. In regards to further details refer to the below sections. After the announcement of CEED results, CEED Admission Procedure 2017 will be started. Applicants can download their score card effectively from 15th March 2017. The score card will be accepted by the various IITs and IISc at the time of admission. However, the validity of the score card expires after one year. All the candidates are required to meet certain eligibility criteria for seeking admission into the respective IITs. Therefore eligible candidates must apply by filling CEED admission Form 2017 for the institute in which they are interested in taking admission. The counselling session of CEED starts after the declaration of results. You can check below details of CEED Counselling dates. Applicants must apply to the institutes they are interested for as per the guidelines and eligibility criteria. No any kind of common counselling for CEED is conducted. All the institute participating in CEED 2017 hold their own written test/interview for selections to the M.Des courses. Selected candidates must make payment of fee and further proceed fo document verification. 10th mark sheet & passing certificate. 12th mark sheet & passing certificate. Domicile certificate (for state quota). The counselling session of Common Entrance Exam for Design (CEED) will be on the basis of candidate’s performance in written and interview rounds. Therefore to receive the latest updates of CEED counselling 2017, stay tuned to our portal regularly and we will also notify you details of Upcoming Engineering PG exams.